The design team from Auerbach Pollock Friedlander became reunited with Phyllis Wattis Theater at the San Francisco MOMA to consult on a reinstallation upgrade coinciding with the museum’s ambitious expansion. The theater was intended to be recommissioned, but design considerations and opportunities were much more than what was originally expected. The Phyllis Wattis Theater was reinstituted with a front screen and rear screen projection system and infrastructure with cinema surround sound, stage-masking systems, and ADA accommodation, along with the addition of new LED lighting equipment. The theater rests at the juncture of the original Mario Botta-designed building and the new expansion, designed by Snøhetta. In order to align the existing building with the new, the theater was essentially cut in half at the cross aisle to set the structure of the expansion project. Len Auerbach, director of design, Auerbach Pollock Friedlander, considered the theater to be the “keystone” linking the new expansion building and the existing Botta building. One challenge was to incorporate a large seismic joint that was essential between the new and old buildings and required an integrated approach to maximizing lighting positions and taking advantage of the limited working height in the space. “The extensive building modifications created an opportunity to really bring it up to current standards and provide and infrastructure for future development,” Auerbach said. 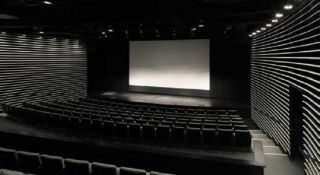 In terms of contemporary use, SFMOMA sought to expand the Wattis Theater’s programming beyond the presentation and archival cinema purpose to attract more music into the space, which necessitated further sound treatment. “Working with Arup and BBI, the design build audio contractor, we recommended that a Meyer Constellation acoustic enhancement system be considered in lieu of variable absorption banners,” Auerbach explained, “mainly because the space was so tight, we didn’t want to take up the additional width of the room to accommodate the variable acoustics architecturally; we did it electronically.” The rest of the sound system is set up for narration and lecture, and then sound reinforcement and a separate Dolby cinema surround sound system. “It worked out to be a very symbiotic approach with all of these systems making the room work,” he said. Auerbach Pollock Friedlander worked with the architect EHDD to create a sound transparent wall. Cinema surround and Constellation loudspeakers are mounted on the perimeter structural wall, performing through the lattice architectural wall. The result creates the visual illusion of a space and no sense of the loudspeaker sources. The design team wanted to take advantage of the volume of the room as much as possible while allowing the sound sources for the surround setup and Constellation system to be as unobtrusive as possible. “If you ran the seating all the way out to the side walls, the sound sources to the end seats would be too close and would be unfortunately very apparent,” Auerbach explained. As a solution, they worked with EHDD, the architect, to create a transparent wall. “The surround loudspeakers are outside on the structural wall, performing through this lattice architectural wall.” The result creates the visual illusion of a space and no sense of localization of the loudspeaker sources. Auerbach Glasow French was involved to upgrade the lighting design in the space. In order for the wall to function as intended, it needed to be lit effectively, so they built a section of the wall, mocked it up in the Auerbach light lab and did lighting mockup testing. “Part of the key to make it work is to illuminate it in a way to make it visually feel that it’s the side wall of the room,” said Larry French, principal lighting designer. The design added LEDs to the existing inventory of incandescent theatrical equipment, readying the space for any kind of broadcast or webcasting that might occur in the future. The architectural lighting applies mostly LED theatrical ellipsoidal spotlights and downlight, along with accent lighting. Beyond the theatrical design work in the theater, the Auerbach team reinstituted front and rear screen projection systems and infrastructure, stage-masking systems, and ADA accommodation. The presentation systems were further designed for future flexibility with the foundation in place for several rear projectors, and the seating and stage were reconfigured as well.